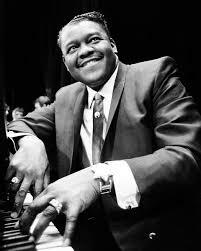 Fats Domino is one of the founding fathers of rock and roll. "Fats" (Antoine) Domino was born in New Orleans, Louisiana, and his French Creole roots had an impact on his musical style. Domino racked up 5 certified gold selling singles in the early-to-mid 1950s. His piano-based r&b was driving and catchy. 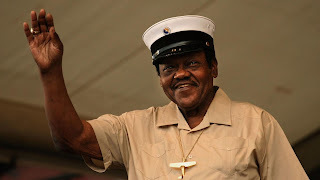 It captured the imagination of young music fans as the new rock sounds caught fire.Fats Domino had a total of 37 single releases that became top 40 hits. Along with the likes of Chuck Berry and Little Richard, he will always be included in any list of the first superstars of rock and roll. Here are 10 of the best known and best loved songs by Fats Domino. This is another Dave Bartholomew penned tune that was originally recorded by Smiley Lewis. 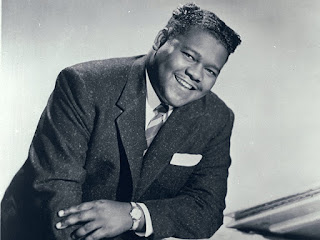 The Fats Domino version was featured in the early rock and roll flick "The Girl Can't Help It." As a single release it reached number 5 on the pop charts in 1956. Domino's vocal is expressive and sells this r&b classic tale of getting through the work week in order get our rewards at the weekend. 3. "Ain't That a Shame"
Again written by Domino and Bartholomew, this was a single release that cracked the top 10 of the pop charts in 1955. Pat Boone's white bread cover of this rocker went to number one. The track features starts and stops and tempo changes that create some dynamics adding to the vibe of the tune. Domino's drawled vocal recounts a tale of love lost. This is pulsating with drive and energy generated by the pumping piano, rhythm section and honking sax. Domino's bluesy vocal sits on top perfectly. It was a number 1 r&b hit, and reached number 4 on the pop charts. The song was written by Domino and Dave Bartholomew. Fat's Domino's most successful pop crossover hit was his 1956 version of this song written in 1940 by Vincent Rose, Larry Stock and Al Lewis. It had been covered a number of times previously by various artists including Louis Armstrong in 1949. Domino's recording became a number 2 hit on the pop charts for three weeks and topped the r&b charts for eight weeks. His blues-inflected sensuous vocal made the song all his own. It is, out of all of Fats Domino's hits, the one tune that is considered to be his signature song.